Goodness infused with flavor. A spiced-up, hot version of our Original Chili recipe made with more red peppers that dials-up the heat on this flavorful chili recipe. Add your own jalapeño or hot pepper garnish for even more heat. 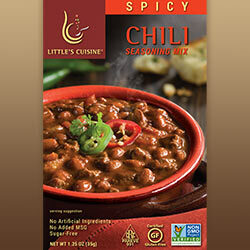 Ingredients: Spices (Chili Pepper, Cumin, Red Pepper, Black Pepper, Oregano), Salt, Dehydrated Garlic. No artificial ingredients, no added MSG, sugar-free, certified gluten-free, kosher and non-GMO project verified.